In recent weeks I have analyzed the behavior of well-known wine commentators when evaluating the red wines of Bordeaux for two specific vintages (2004 and 2005). I will finish this series by expanding the analysis to include many vintages and also the "official" classification of the Bordeaux wineries (called "châteaux" even if they do not have an actual château). Albert Di Vittorio and Victor Ginsburgh (1996) Pricing red wines of Médoc vintages from 1949 to 1989 at Christie's auctions. Journal de la Société Statistique de Paris 137: 19-49. I have then supplemented these data as best I could, to fill in missing values. The price index constructed by Di Vittorio and Ginsburgh based on a regression analysis of Christie's auction sales, which takes into account wine age, no. bottles, bottle size, year of sale, case opened/unopened. The scores have been converted to a 0-20 scale; and there are considerable missing data, especially before 1970. The manhattan distance measure was calculated between each pair of evaluators, and the result displayed as a Split Decomposition network. People who are closely connected in the network are similar to each other based on their rating patterns, and those who are further apart are progressively more different from each other. Note, first, that the split uniting the critic Robert Parker with the auction prices is slightly better supported than the one for the critic James Suckling. The local Bordeaux brokers (Tastet & Lawton) do not have a split shown that unites them with the prices. This supports the common observation that it is usually the internationally known wine critics' evaluations of the vintages that strongly influences the auction prices — a well-regarded vintage will sell for a higher amount. Second, the terminal edges are quite long relative to the internal ones, indicating that a lot of the variation of the vintage evaluations is unique to each evaluation source. They certainly do not agree very much with each other about which vintages are better than others. In particular, note that the auction price has a very long terminal edge, indicating that much of the variation in the prices is actually independent of the opinion of the professional wine evaluators about the quality of the vintage. Moving on, let us now consider the wines themselves. In 1855 the Bordeaux Chamber of Commerce requested the Bordeaux Brokers' Association to rank and classify 60 Haut-Médoc châteaux according to quality, ranking them in five categories: First to Fifth Growth. This was done for use at the Exposition Universelle de Paris, the world's fair of the day. This ranking is said to have been based on the long-term wine prices achieved by the various vineyards, plus some local politicking (the prestige of the wine and the owner, etc). It is preposterous to imagine that this ancient ranking could still apply unchanged today, and yet it continues to play a large part in contemporary wine lore and seems to be a big determinant of wine prices (eg. the five "first growths" sell for 3-6 times the price of the best-regarded "second growths", even though it is widely acknowledged by wine critics that today they are not much better in quality). Alexis Lichine (1979) Guide to the Wines and Vineyards of France. London: Weidenfeld & Nicolson. Patrick Dussert-Gerber (1988) Guide des Vins de France 1989. Paris: Albin Michel. Robert M. Parker (1990) Les Vins de Bordeaux. Paris: Solar. The Liv-ex Fine Wine 100 Index, which tracks the prices of 100 top wines (95% of which are from Bordeaux). Data were released in 2009, based on price averages calculated from 2003-2007, and again in 2011, based on prices from 2005-2009. I have taken the average of these two data sources (and called it the 2010 price). For the first data analysis I have restricted myself to the 5-class classification rather than the rankings, so that the scale for each château is 1-5 for each of the five classification sources, with a small amount of missing data. The manhattan distance measure was calculated between each pair of classifications, and the result displayed as a Split Decomposition network. 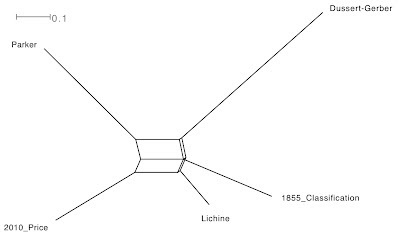 Note, first, that the creation of the Liv-ex 2010 wine price was an exercise designed to emulate the procedure used to create the original 1855 classification. It is thus interesting to note that the best-supported split separates these two classifications! As anticipated, modern perception of the quality of the châteaux does not closely match that 150 years ago; and it is time that wine writers stopped mentioning 1855 as their first comment when introducing Bordeaux wine. The best-supported split actually unites the Parker classification with the current prices, which is not unexpected given the influence that Parker is recognized to have on Bordeaux wine prices, particularly in the USA. It is for this reason that Parker-recommended wines will never be good value for money. The long terminal edges for most of the classifications emphasize their unique nature. Indeed, the lack of uniformity between the classifications makes wine classification look distinctly more like an art than a science. 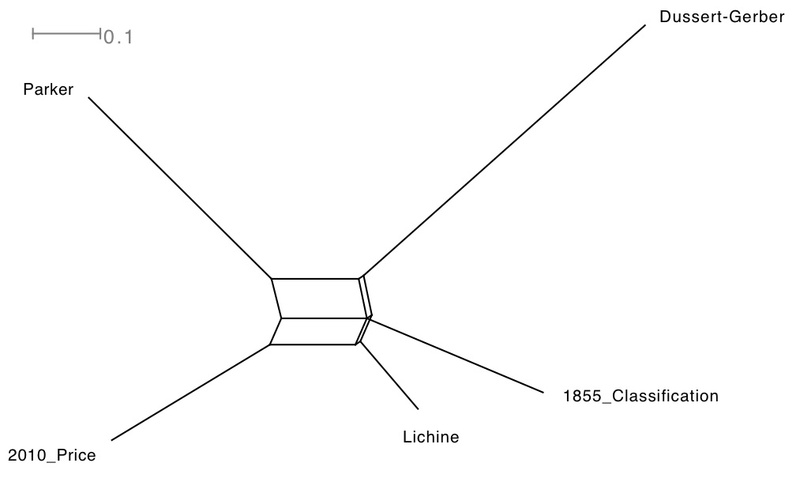 Finally, it is interesting to note that Lichine's classification appears to be a compromise between the current price and the 1855 classification — this is supported by the second-biggest split, and Lichine has the shortest terminal edge. This was, of course, Lichine's stated objective: a marriage of the old and the new. This leads us to the châteaux rankings rather than their classification. 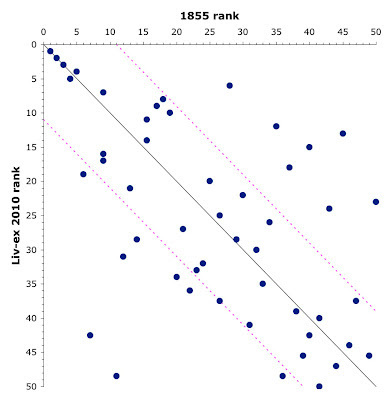 The following graph plots the 1855 ranking of 50 château (out of the original 60) against their ranking based on the 2010 Liv-ex Fine Wine price ranking. Only the top three châteaux are still in their same ranked position, although 34 (two-thirds) of them are within a rank of 11 of where they were in 1855. However, the calculated r-square value reveals that only 32% of the variation in current ranking is associated with the 1885 ranking. Metaphorically, the glass is either one-third full or two-thirds empty, depending on which way you view your wine glass. Château Lafite Rothschild, Château Latour, Château Margaux, Château Mouton Rothschild, and Château Haut-Brion (with Mouton and Haut-Brion having swapped places since 1855). The stand-out second growths are: Château Palmer (up from rank 28) and Château Léoville-Las Cases (up from 9).